Premier Houseboats are pleased to present Explorer II, an historic vessel built for the admiralty as VIC35 in 1945, that has been converted to a truly unique houseboat, and is ready for completion on a residential mooring with stunning views across the river Medway. This boat has everything, spacious and unique living space already converted, the potential for plenty more living space, and a fully running engine should you need it. There is also plenty of history on the vessel available. There are many truly unique qualities, including a hydraulically operated main hatch that opens up the main living accommodation to provide an amazing sunroof. The boat has had some extensive work carried out already, with the main hold emptied and converted, and a new steel deck house has been built. Accommodation currently comprises a large open plan living area that incorporates a large lounge diner with amazing headroom, and a new fitted kitchen with solid wood worktops, a walk in larder and a gas fired Aga Range master. There is a bespoke bathroom with a free standing roll top bath. Stairs lead from the main accommodation up to the new deck house area currently used as a large double bedroom. Further accommodation ready to convert includes a cabin to convert to a double bedroom, a large storage area that could be a further living area or large double bedroom, and the original deck house that currently has ample seating, worktops and a sink. There is also a wheelhouse area up from this deck house. Outside space is plentiful, allowing you to relax comfortably and enjoy the stunning views. The boat has a wood burning stove as well as a full diesel fired central heating system with architectural radiators. The main living areas are fully insulated and have been fully rewired using marine grade cable. Mechanically, the boat has two engines, the main engine a Volvo 6cyl 260 hp, and a wing engine a Volvo 6 cyl 165 hp. The generator is a 3 phase 4 cyl Perkins diesel that powers the Hiab and hydraulics for the main hatch. This is an amazing opportunity to buy a superb character home, with plenty of scope to put your own mark on the already impressive conversion work. 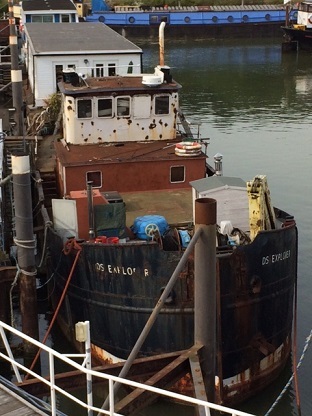 Vessel name: Explorer Vessel condition: good Vessel type: Clyde Puffer Builder: Isaac Pimbolt & Sons Model: VIC35 Year constructed: 1945 Year refitted: 2012 No. of engines: 2 Engine model: Volvo Engine power: 425 Fuel type: Diesel Length over all: 66' Beam: 18' 5" Maximum draft: 7' Hull material: Steel Hull type: Flat Hull colour: black Disclaimer Premier Houseboats offers the details of this advert in good faith as it was presented by the seller or his representative but cannot guarantee or warrant the accuracy of this information nor warrant the condition of the described item within this advert. A buyer should instruct his agents, or his surveyors, to investigate such details as the buyer desires validated. The Item described within this advert is offered subject to prior sale, price change, or withdrawal without notice.